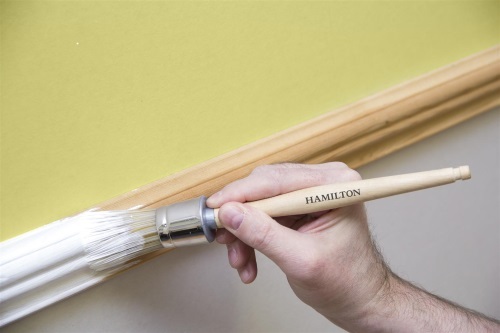 The Hamilton Prestige range is a collection of specialist brushes for professional painters and decorators. Hamilton understands how important it is for decorators to have an arsenal of different brush types, each designed to perform well for a specific job. Each brush provides better results than a traditional flat brush. The utmost confidence can be had in Hamilton products, since they are developed in conjunction with the Hamilton ‘Decorators Panel’, a group of UK based professionals who give invaluable feedback on the products. These professional synthetic brushes have been tested on the job with various paint types and can be used in both water and solvent based paints, though a greater finish will be achieved when used in modern water and hybrid paints. A handy hint when using these brushes to work with water paints is to dampen the brush before use to aid pick-up and flow, and to prevent paint drying in the stock. This oval angle synthetic brush is ideal for cutting in or for edging when precise, sharp painting is required. It is ideally placed to perform well in these situations where accuracy is required due to its angled head, which delivers a more accurate and controlled paint distribution than a standard flat head brush. The oval shape of the brush allows for increased paint pick-up, which contributes to greater coverage over larger areas than traditional flat brushes or thin series cutting in brushes. As a result the Prestige Oval Angled Synthetic Brush comes into its own when used around door frames and woodwork. This brush is available in 1” and 1 ½”. Available as both 2” and 3” brushes, the Angled Synthetic is ideal for painting hard to reach areas, such as awkward fascia boards. Its angled head offers control when reaching to areas like above door frames and can be used inside and outside. Finely tipped filaments on the brush means it creates a great finish on all painted surfaces. 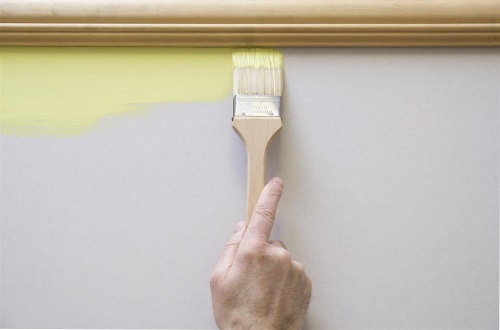 It can be used for painting walls, ceilings, woodwork and doors. The Prestige Round Flat End Brush is the perfect cutting companion with its 1” size, particularly around and in corners where even paint distribution can be a problem. The rounded head on the brush allows for greater paint pick-up and larger surface coverage. The brush has a contoured stem handle which offers comfort and control. The filament length has been optimised to provide optimum pick-up of paint and finish. It is the idea tool for painting Georgian windows and doors. The Prestige Flat Tip Sash Brush contains tools which are ideal for small and detailed work which would be difficult with a larger brush, for example creating thin sharp lines, or text creation. The tools are also great for cutting in around small objects like light switches. The slanted cut of the brush is what enables this high level of control for detailed work, along with a cleverly designed handle for control and accuracy during use. The handle is also extra-long for easy access to reaching areas. The 3 pack contains ½”, ¾” and 1”.